The Secret Life of Walter Mitty Home Entertainment Review | SWITCH. When a film is a labour of love, it comes across on-screen. Regardless of its quality, you can see that the creation of this film meant something to the people making it, and that can often take it over the line from forgettable to memorable. To find this quality in the independent world is hard but not unheard of. To find it in a major studio film is almost impossible, the system often wringing all that love out of the finished product. All this makes Ben Stiller’s ‘The Secret Life of Walter Mitty’ a more unusual and special film, because that care and affection is still injected into every single frame of the film. Walter Mitty (Ben Stiller) is the manager of negative assets at Life Magazine just as the legendary publication is coming to an end. Walter tends to disappear into the background a lot, which means he escapes the notice of Cheryl Melhoff (Kristen Wigg), a co-worker he is falling for at a distance. To escape his dull existence, Walter escapes into his daydreams, where he can be the man he wants to be. But when famed photographer Sean O’Connell (Sean Penn) sends cryptic clues as to the location of his submission for the cover image of the final issue of Life, Walter is thrown into a quest to find the negative that takes him out of his office and around the world on an adventure that might just fulfil his dreams and get him closer to understanding who Walter Mitty actually is. Ben Stiller has shown great talent in the director’s chair before, but never anything like this. ‘Walter Mitty’ is, at the very least, a startling technical accomplishment, a delicate work with stunning cinematography, elegant editing and a gorgeous score. The scope that Stiller employs in his expansion of James Thurber’s classic short story is wholly cinematic, working in conjunction with the various environments and landscapes to create Walter’s rich visual world. The screenplay by Steve Conrad is a tricky tightrope to walk, the sentimentality sometimes falling flat and the humour often ill-pitched, but it excels at its more poignant moments, and Stiller takes these and runs with them, often selling those moments another director might have fumbled with. But it’s clear that every word and every image on screen is there because everyone making the film wants it to be there. Even the impressive supporting cast behind Stiller, who gives one of his best performances to date, clearly all care about this project, and that helps lift ‘Walter Mitty’ out of the pit of sentimental garbage and into a genuinely moving and affecting film. It wears its heart on its sleeve, unashamed of its belief that life is about following your dreams and that Walter is a conduit for us to do that. The world Walter sees, both in his dreams and his adventures, is a wondrous one, and sequence after sequence leaves you breathless. You can’t help but stare in wonder with your heart full of joy because the film is full of just as much joy. his is one of those films that just makes you so happy to be alive. ‘The Secret Life of Walter Mitty’ is an instant classic. It has many faults and isn’t always on the money, but for once, that doesn’t matter an inch. Ben Stiller has crafted (and "crafted" is exactly the word here, crafted with care and attention) a sweeping cinematic experience. Walter is an everyman in the best sense of the word, and someone whom we can all see ourselves in. This is one of those films that just makes you so happy to be alive. For the Blu-ray release, Fox have gifted the film with a 1080p 2.35:1 transfer transfer that beautifully captures the beautiful visual world of ‘Walter Mitty’. Colours are balanced and saturated and detail is crystal clear. Much of the success of this film is due to Stusrt Dryburgh’s cinematography and, just as expected, this is the kind of film that demonstrates the capability of high definition. The same can be said of the DTS-HD MA 7.1 track. Initially the film seems like a modest one in terms of sound, but once it hits its stride, it really sings. All round a great technical presentation and one this film deserves. Fox have offered a modest yet informative set of extras for ‘Walter Mitty’, the bulk of which is a series of behind-the-scenes featurettes that cover the development and production of the film. Stiller and his team discuss the original short story, the extraordinary locations in the film and the very particular visual look, inspired by the classic photography published in Life Magazine. It’s another demonstration of how much care and attention went into making this new version of ‘Walter Mitty’. There’s also a collection of deleted, extended and alternate scenes that offer lovely little beats that expand both Walter’s reality and fantasy world. The package is rounded off with a gallery of reference photography and the music video for José González’s ‘Stay Alive’, the end credits song for the film. The 'The Secret Life Of Walter Mitty' competition has now closed. Winners will be announced shortly. Competition opens at 5pm AEST on Sunday 4th May 2014 and closes at 11:59pm AEST on Sunday 11th May 2014. Five winners will be chosen at random on Monday 12th May 2014. To successfully win, entrants must fulfil the above entry conditions before the time the competition closes. Current members/followers are eligible to enter the competition. Only one entry per person. Only one winner per household. To be a valid winner, the entrant must not have won a prize from SWITCH within the last 28 days. Each winner will receive one Blu-ray copy of 'The Secret Life Of Walter Mitty'. By entering, you agree to receive occasional emails from SWITCH in the future. If you decide to unsubscribe from these updates, any further entries will not be applicable. Only Australian residents are eligible to enter. 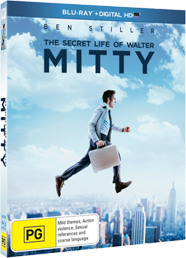 'The Secret Life Of Walter Mitty' is available on Blu-ray and DVD on Wednesday the 7th May 2014 from 20th Century Fox.